LUFKIN, TX (KTRE) - The Buckner Family Place gladly accepted a donation of 16 computers Monday afternoon that will be given to women who are working through various programs at Angelina College. The computers were donated by Lufkin Senior, Elie Free. Free has been working on getting his Eagle Scout certification from the Boy Scouts of America. The award was founded in 1911 and only about four percent of all scouts reach the honor. 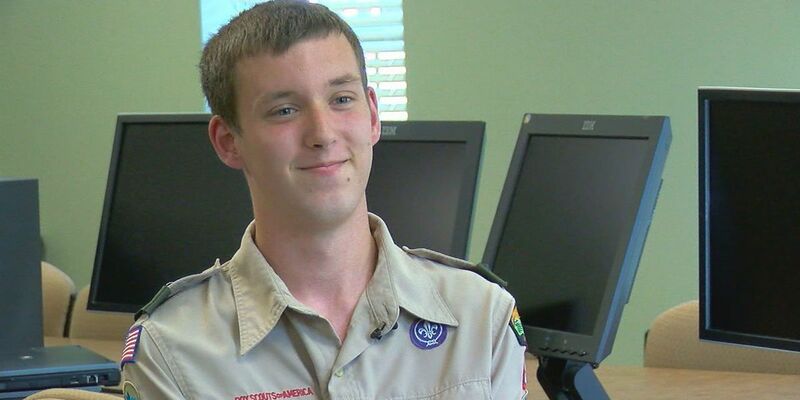 To get an Eagle Scout award, the scout must have been a Life Scout for at least six months, earned a minimum of 21 merit badges, demonstrate the scout spirit, demonstrate leadership with his troop and plan and lead a service project in the community. All of these must be met by the age of 18. The project is then submitted to a panel for review. Free was able to do his requirements within a month of turning 18. When doing research on who he might give refurbished computers to he was pointed early on to the Buckner Center in Lufkin. "Usually we have to go after funding sources and opportunities for our residents but to have them come to us for this opportunity was just amazing," said Marisa Phillips, Executive Director of Children Services for Buckner in Lufkin. "This will help so many of the single mothers that we help out." Free would get Dp Solutions and The Texas A&M Forest Service as well as classmates from his robotics team to donate the computers and other hardware for the project. He was also able to get his fellow classmates to help with the project. Free admitted he was grateful and also learned a lesson in leadership. "Getting them all in in one day was hard," Free said. "Assigning them tasks and keeping them focused was also a little difficult." Free is heavily involved in robotics at school and enjoys working on computers and other technology. For him he felt it was important to give back to the community. "I know hard it can be to perform the tasks they give you without a computer," Free said. The donation also came at the perfect time for the non-profit. "We had 13 new residents join us this fall and not all of them have computer access," Phillips said. "We have a few computers here in the office with printers. They can also use computers at the college, but for some of these women they have limited time due to being a parent. If they cannot get to those they sometimes borrow a friends. This will help so much." The computers also came with a special gift from the Microsoft Corporation. During the summer while working on the project, Free was able to meet with executives form the company at a special STEM camp held at the school. Microsoft partnered with the district to offer a pilot program that was the first in the United States. While in the camp, Free participated in the Hackathon project and while doing it was able to meet with one official who fell in love with the project and wanted to help out. "She liked the idea and she offered to donate 25 keys for Windows 10,"; Free said. "This was great because I had planned on using an operating system that would not have cost anything but would have needed to have a manual made because they were probably not familiar with it. This makes it easier for everyone." The project between Free and Buckner is not just a one time deal. Free has inspired others within the district and the partnership between Lufkin ISD and Buckner is planned to continue for several more years. The robotics group plans to make the project an annual deal. "The stars aligned for us on this," Lufkin teacher Robyn Segrest said. "Elie saw this as a unique need and organized it from top to bottom. He was able to put together the people and the donations to rebuild and refurbish these systems. They're not going to a landfill, they are going to families who can use them to become successful. The Robotics team will take this on as an ongoing project for hopefully years to come thanks to Elie. He's just that kind of kid." Free will now have to fill out paperwork and send it to the regional office in Tyler where he will await approval. Once approved Free will have a special ceremony with family and friends. Free will be going to Stephen F. Austin State University to get a degree in physics. Free then will enroll in a special program that would allow him to transfer to Texas A&M after two years to pursue a degree in engineering. More on Buckner can be found here.